Since the election of Mauricio Macri in November 2015, Argentina has found itself at the sharp end of an assault by Latin America’s New Right. This is the same New Right that in Brazil has just voted to impeach an elected President, in what amounts to a parliamentary coup, by a congress where corruption and criminality are rife. Macri, like his Brazilian bedfellows, the head of the lower chamber Eduardo Cunha and the Vice-President Michel Temer, has a liking not just for offshore companies and channelling public money to friends and associates. The co-owner of Fleg Trading, Kagemusha, Opalsen S.A. and Macri Group Panamá, involved in more than a dozen front companies in tax havens, also follows the example of his counterparts in Russia, Ukraine, Syria and Qatar implicated alongside him in the Panama Papers, in using the judiciary to persecute opposition and block free speech. In contrast to what has happened with Putin, Assad and Poroshenko, the Argentine news outlets affiliated to the International Consortium of Investigative Journalists have downplayed the President’s involvement in the offshore accounts scandal. With the approval of their international partners, the dailies La Nación and Clarín kept Macri’s dirty secrets under wraps until after the presidential elections. What’s more, his government was given a month’s warning about the publication: plenty of time to come up with PR and legal strategies to divert attention away from the shocking revelations. The role of the mass media in the political establishment and in favour of the well-heeled is nothing new. However, there are different levels of obscenity, and the Argentine case is perhaps one of the most flagrant of recent times. When, under the leadership of the German paper Süddeutsche Zeitung, news outlets from several countries were invited to join the investigation, the only Argentine representatives were Macri stalwarts. No independent voice was allowed. To cap it off, La Nación itself appears in the Panama Papers, as the owner of offshore holdings. Events following the revelations leave little room for doubt. When the Panama Papers were released to the world, Macri’s inner circle had already woven a web of counter-revelations as cover, in particular an avalanche of accusations against former members and supposed associates of the previous administration. Macri, meanwhile, declared himself “surprised” at discovering he was the director of offshore companies, along with his father and brother. The culmination of this operation was to bury the inevitable investigation against the current president with another, the next day, against his predecessor, Cristina Fernández de Kirchner, which of course dominated the front pages. Macri’s main excuse, that one of the companies was created to support a business plan that never came to fruition, was embarrassingly scotched by Página/12 through a simple Google search, which unearthed an incriminating article from 2002 by, believe it or not, none other than La Nación. At the same time, information has emerged suggesting that offshore companies in the name of Macri’s former finance minister in the City of Buenos Aires could have been used to transfer millions from the public coffers to the electoral campaign of his party, the PRO. Media protection for the president and many of his ministers is just the tip of a very large and decades-old iceberg. The Clarín Group is, in proportional terms, one of the most dominant media conglomerates in the world, owning cable TV platforms, internet service providers, radio stations, free-to-air television channels and print media. The newspaper of the same name has the second-highest circulation of any Spanish-language newspaper in the world. Alongside La Nación, the Clarín Group is a major shareholder in the dominant newspaper manufacturer Papel Prensa, acquired in questionable circumstances under the last dictatorship. As in Brazil with O Globo and O Estado de São Paulo, this has allowed them an almost 40-year hold on printed and audio-visual public discourse. The Kirchnerist government attempted to break up this monopoly through its Media Law, voted in by a wide margin in both chambers of parliament in 2009. The law would earn the sorry distinction of being the most legally disputed in Argentina’s history, until in 2013 the Supreme Court declared it constitutional. 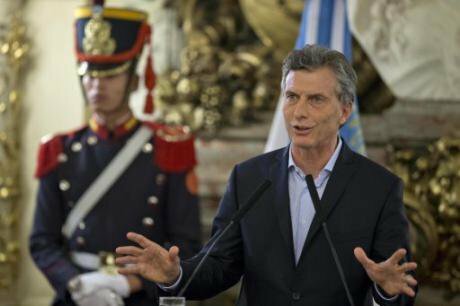 On his first day in office, Macri hurriedly repealed the law by emergency decree. As a result of this bit of mutual back-scratching, the Clarín Group not only no longer has to divest itself of holdings, but is now in the process of signing contracts to access the only piece of the puzzle that was missing – the mobile phone market. As a result of this resurgence of the conservative conglomerates, the few media outfits opposed to Macri find themselves in dire straits. Journalists who have raised critical voices have been sacked. So it’s no surprise that armed attacks on opposition buildings and bomb threats against human rights organisations have gone almost unnoticed. Demonstrations against the government have been ignored or underestimated, as have massive layoffs which, according to union sources, have now accounted for some 200,000 workers since Macri’s investiture. It was always clear that the new government’s austerity policies would please few, and media manipulation would be needed to keep a lid on things. However, the sheer force with which this is being carried out brings chilling memories of the darkest moments in Argentina’s recent history. The media’s protection of Macri’s administration works in conjunction with sectors of the judiciary who, under the banner of denouncing “corruption”, are effectively seeking to go after, weaken and, if possible, imprison members of the opposition. The judiciary’s prominent role is nothing new, but part of a region-wide onslaught best exemplified in neighbouring Brazil, where Judge Sérgio Moro has spearheaded the campaign to prosecute former president Lula da Silva. Although a similar trend has been underway in Argentina for quite some time, it has gathered momentum and expanded in scope with the current judicial offensive against Macri’s predecessor, Cristina Fernández de Kirchner: Judge Claudio Bonadío – an outspoken supporter of Macri, formerly linked to the notoriously corrupt government of Carlos Menem, accused of burying cases related to the traffic of contaminated blood and the terrorist attack on the Jewish Mutual Association (AMIA) in 1994 – called the former president to testify in court. Resting on shaky legal ground, the case is viewed by a broad range of jurists as outright political persecution (the judge accuses the previous government of fixing the exchange rate, a measure that undoubtedly falls within the remit of any government.) The judiciary’s pursuit of Fernández de Kirchner should be viewed within a broader pattern of judicial anomalies, most notably the arrest of indigenous activist Milagro Sala in the northern province of Jujuy, where even her defence lawyer has been threatened with legal action. These judges, serving the interests of politicians and the media, appear to share a common goal: to see the opposition leaders behind bars. Yet, this same judicial power has been alarmingly remiss in investigating key figures of the current administration, not least Macri, who is implicated in a number of cases, the latest of which concerns his offshore businesses. Judges tend to be openly partial, aligning themselves with the ruling government’s political objectives – above all, the eradication of Kirchnerism’s symbolic power. Yet, there is something more serious afoot: a judiciary that sees its function as that of political watchdog, that seeks to strip the popular struggle of its historic meaning, and that operates as a powerful tool for the neoliberal management of society. The electoral campaign that brought Macri to power rested on an image of professionalism and respect for state institutions portrayed by corporate media outlets as either dysfunctional or encroached upon, manipulated and used by the Kirchner administrations for political and/or economic gain. Adhering to a traditional script drawing on elements from the Old and New Right, the campaign demonized any inclusive citizenship policies and dismissed them as nepotism or pork-barrel politics. In spite of these relentless accusations, the incoming administration did not see an issue in appointing their nearest and dearest to senior and mid-level government posts, whilst portraying the mass layoffs of state workers as guided by prudence and the need to get the government house in order. Beyond the cynicism associated with such shock policies, and however anecdotal the hiring of husbands, wives, cousins, in-laws and friends might seem, the real point is that this new political agenda marks the transfer of power and control of the economy to large corporations linked to members of Macri’s government. These are the coordinates within which to read supposedly disconnected phenomena: relatives and friends being hired as government officials or being awarded contracts; support for speculative capital as exemplified by the government’s pledge to pay off the holdout or “vulture” funds; and the president’s offshore accounts, the supposed “legality” of which is underpinned by the logic of transnational capital. If you’re truly hungry, you’ll swallow anything. The seemingly unrelated events of the offshore activities of Argentine business owners, the legal/media persecution of politicians or social activists who dare to differ from the Washington Consensus, and the inhuman statements made by members of the current administration to justify the withdrawal of support for vulnerable sectors of society – such as the declaration made by the vice-president of the School Council for the Province of Buenos Aires to defend the distribution of out-of-date milk in poor neighbourhoods –, are, in fact, closely tied together. The link is the extraordinary rate of tax evasion in countries like Argentina. For decades, corporate media have levelled one accusation after another of corruption at politicians working against its interests precisely to feed the idea among the general population that paying taxes is pointless in a country where civil servants appropriate public funds or squander them on superfluous state projects. For decades, the dominant media companies have, as a result, stirred up an absurd but extremely effective feeling of solidarity between small business owners, professionals and those workers required to pay, as is the case in any part of the world, income tax, and the large-scale business owners who, like Macri and his family, have set about opening offshore accounts to escape such fiscal obligations. This campaign can be summarised by comments made by the journalist Jorge Lanata for the Spanish newspaper ABC, published on 12 December 2015: ‘Macri doesn’t need power or money. It’s very noble of him to want to take on the current chaos in Argentina’. It would be hard to find anywhere in our history such a forthright declaration of love for plutocracy than the notion that we should include the rich within politics and exclude the poor on the grounds that the latter are tempted to misappropriate public funds. All of which gives some idea of the reach of this campaign, not just because such a repellent statement can be made but also because such a large sector of public opinion is in agreement with it. Plutocracy, after all, may well simply be the former name for this new offshore democracy.